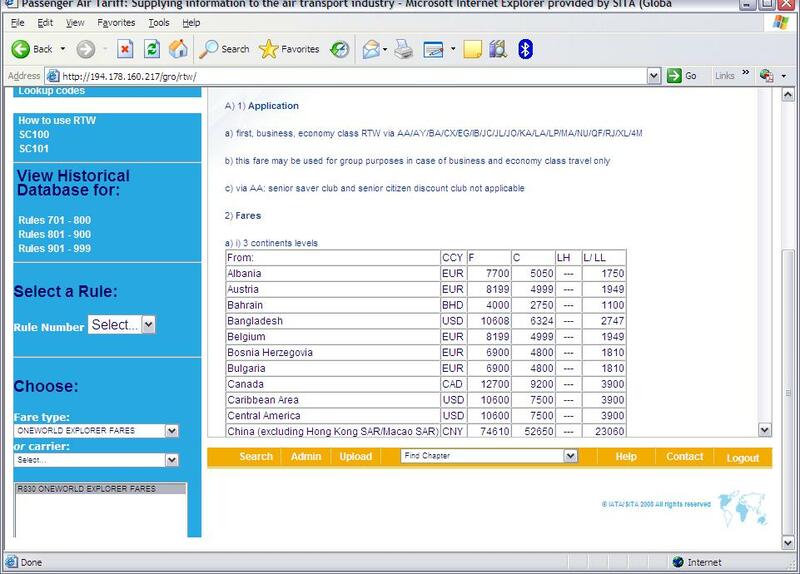 Carrier exceptions for PAT participating airlines and more.. This User Manual explains how to navigate through the site and the individual sections. The URL of General Rules Online is http://www.pat.aero. It is advised to bookmark this address. See images below. On this page you are able to request trial access, subscribe, check whether you can run General Rules Online according to the system requirements, read General Terms & Conditions etc. This is also the login page. Recent changes show the latest changes in General Rules Online. Generally, this will be updated weekly depending on when information has changed. Via this page you will be able to click through to the current or previous paragraph depending on the type of change that has taken place. If you click on , the current paragraph will be shown. By scrolling down through the paragraph it will be easy to identify the changes as they are shown in a different colour, namely in magenta. A summary of these changes will be communicated to you by e-mail so that you always know where, when and what type of changes have taken place within General Rules Online. A search button has been placed in the top frame. The first screen allows you to enter one keyword or a combination of words, then click on Search. The results are shown below in the same screen. You will then be able to refine your search by typing in a second keyword in the second field and click on Search Again. The results are shown per chapter and by scrolling down you can see in which chapters the keyword(s) have been found. Each result shows a sentence or a paragraph where the keyword(s) have been found. Behind each result, you see the word GO. Clicking on GO will lead to a pop-up screen showing the paragraph content. If there are many results per chapter, only a few are shown on the first screen. To see the other results, just click on More. Under this button, shown in the top frame, you can search for city, carrier, and country codes and names. If you click on the words Lookup Codes in the top frame, a page will be loaded that provides you with the possibility to search all three options. See below. Additionally, this screen also provides access to State, Province, and Territory Names and a list of Cities sharing the same Airport. In the image above you can see a pull down menu appear in the top frame. This allows you to search a code or name of either cities, countries or carriers. If you click on for instance Countries a pop-up screen appears in which you can search for the code or name of a Country. Additionally, this screen also provides access to State, Province, and Territory Names and a list of Cities sharing the same Airport. The advantage is that with a pop-up screen you can continue browsing the site and still have this (extra) screen at your disposal. Another advantage is that in this screen you can also search using the alphabet. Navigation through each chapter under General Rules is simple and consistent. It works the same with each chapter. When you click on General Rules you will see the chapters appear in the left menu. The yellow icon refers to the historical database which will be explained in the next section of the User Manual. Below you will see an example where the Baggage chapter is shown. In the left menu, you can search in different ways. 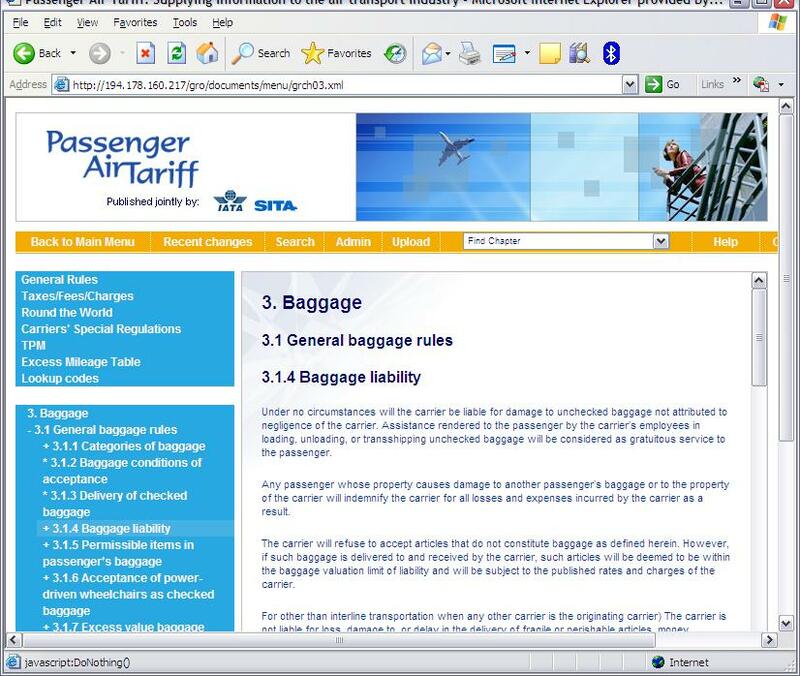 You can request all the information under a paragraph, for instance 3.1 on the screen by clicking on the title "General baggage rules". However, you can refine your search by clicking on the plus sign shown before the title. This way the search will be more efficient and will take less time. The version numbers are imaginary. Click on one and that version will appear on your screen. The date indicates when the information was made live on the General Rules Online site. You are able to view changes between the latest version and the older one you select. After clicking on View Changes, you will see a list of changes that have taken place since the date you entered. With each change you have the opportunity to view the recent version or old version. 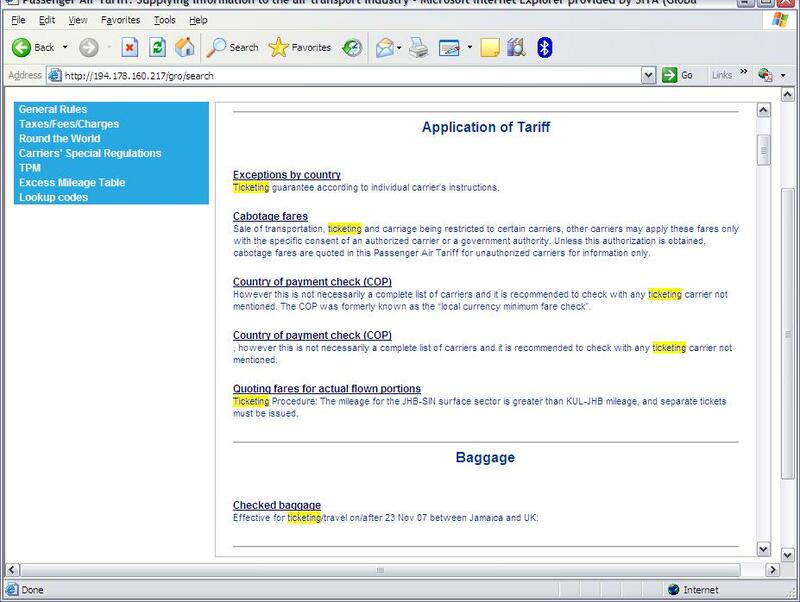 If you open a paragraph, you might notice that certain information is highlighted. This indicates that compared to the previous version, this specific information has changed. Images in the chapters are generally shown as links in the text. Images have been made available in different formats, like jpeg (jpg), bitmap (bmp) or SVG (svgz). With SVG you need to download a free plug-in to view the images; the SVG viewer. You can download this by clicking on the link shown in the left menu of those chapters that contain images. After clicking on the View Image link, a pop-up screen appears showing the image. Readability can be improved in different ways depending on which format has been used. You can check the format by looking at the top of the screen where the address is shown. This is an example of an SVG image. the image can be saved by clicking on the right mouse button and select Save SVG as. However, only with the program Adobe Illustrator you will be able to view the image. 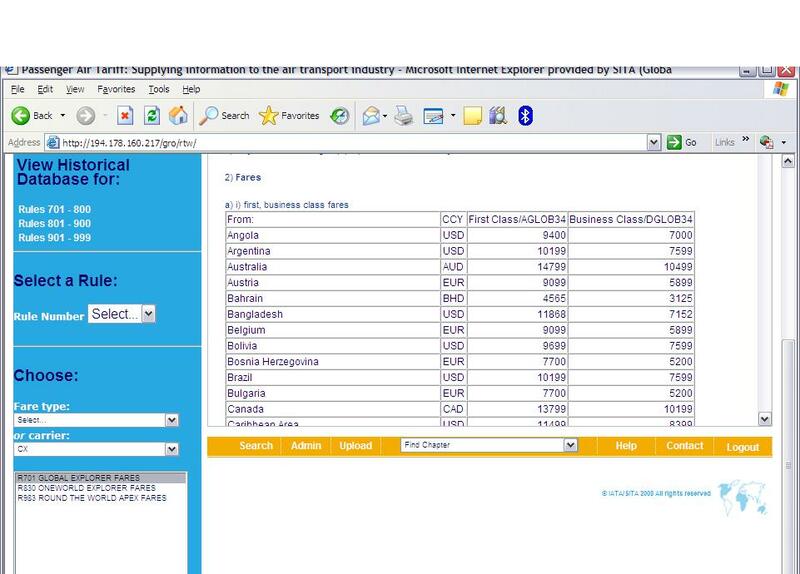 In this example, the fare type "Oneworld Fares" has been selected. There are two hits that are shown in the box below in the left menu. By clicking on one rule in that box, the content of the Rule will appear. This works similar when selecting a carrier. See below. In this screen you can look up the mileages between city A and B. There are two ways in which to find the exact mileages. 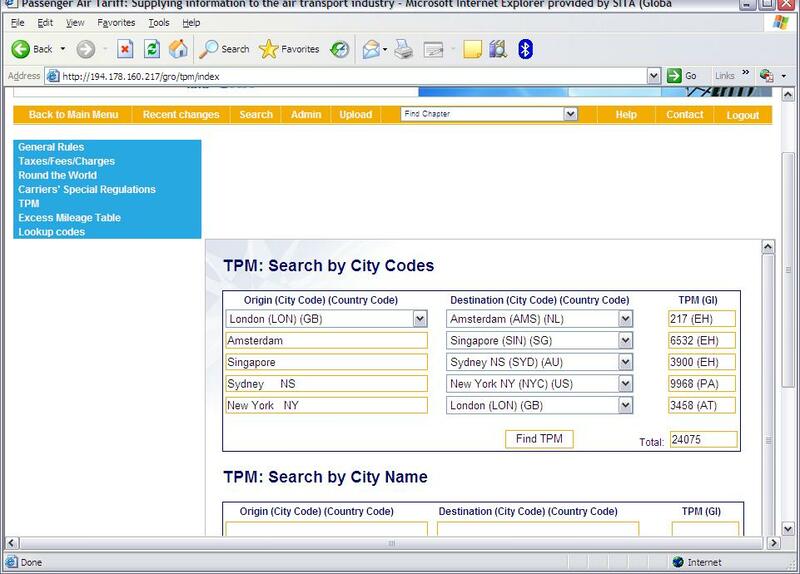 You can type in a name (first box) or code (second box) in Origin and Destination city and click on Find TPM. If there are more hits under one name you can select the right one by clicking on this sign and all hits will be shown. 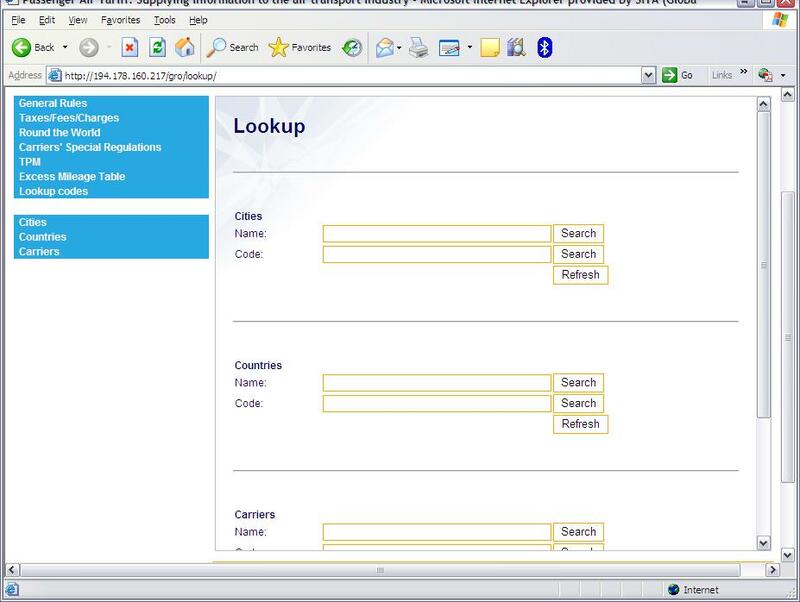 The words city codes and country codes shown between brackets in both boxes are there to explain what the codes mean that are displayed in the Origin and Destination boxes behind the city name. The Destination city in the first line will automatically be shown as Origin city in the second line and so on. All TPM’s are added up and the total is shown in the right corner below under TPM. If you would like to change an Origin or Destination city, select Search Again in the fold down list of each field and the field will be emptied. 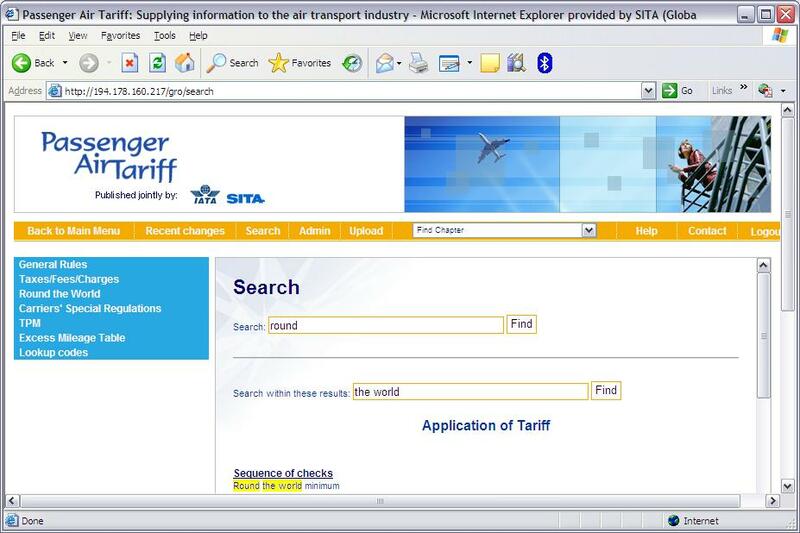 This section shows the PAT Participating Airlines individual regulations. 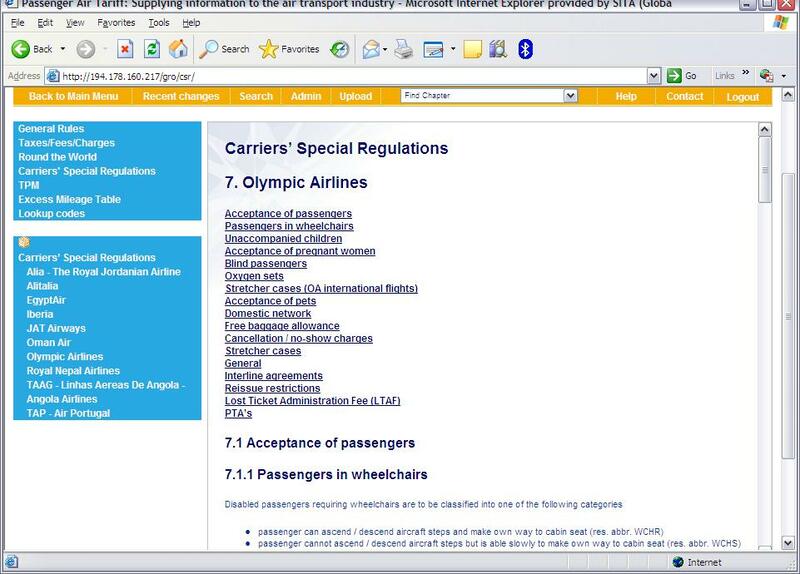 By selecting the carrier in the left menu, the special regulations of this carrier appear on the screen. You can scroll down through the information shown or go immediately to a specific section by clicking on one of the links shown at the top of the screen. 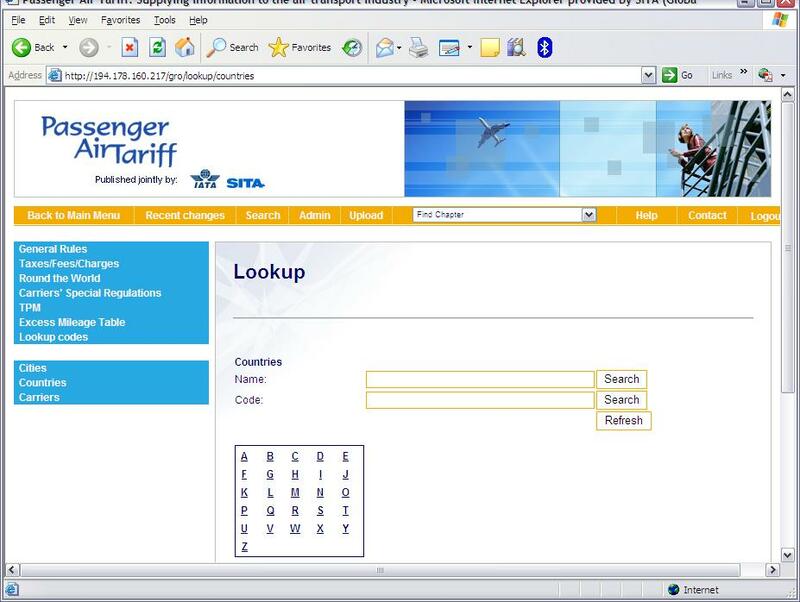 If you have questions or if you encounter problems, review the help file first before contacting Passenger Air Tariff.